Glow in the Dark Sands Alive! Kinetic sand might be one of the coolest, most addictive toys to come around in quite some time. And at Vat19 we know that when you want to make something awesome even awesomer, you make it glow in the dark! Glow in the Dark Sand acts like wet beach sand, but it's completely dry and mess-free! And because it only sticks to itself and not your hands, feel free to sculpt it, mold it, and write on it anywhere — especially indoors! Once you transform the pliable substance into a sand castle, pyramid, or creature, add fun details by drawing on the sand with the included UV pen. Wherever you draw, the sand will glow bright green in the dark! After turning out the lights, keep your awesome creations glowing (and the fun going) with the included UV glasses. They rest comfortably on your nose, freeing your hands so you can create for as long as you want in the dark. Playing with sand indoors is pretty awesome. Playing with sand indoors and in the dark is amazing. 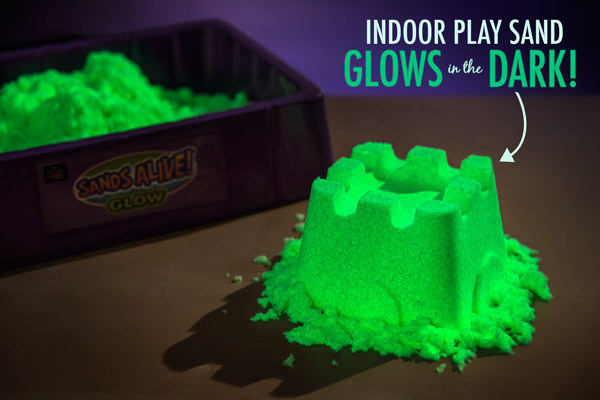 Glow-in-the-Dark Kinetic Sand feels wild to the touch, and looks incredible with the lights off. Just flip the switch and sculpt, mold, and slice this special compound into whatever your mind can imagine. 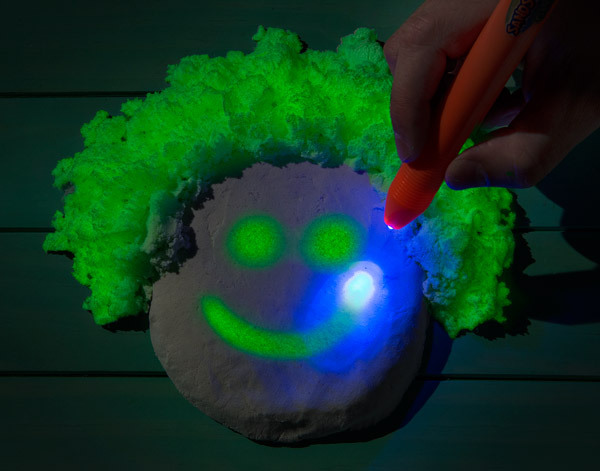 Glow-in-the-Dark Kinetic Sand is made from a unique compound that sticks to itself (but not your hands!) and will never dry out. 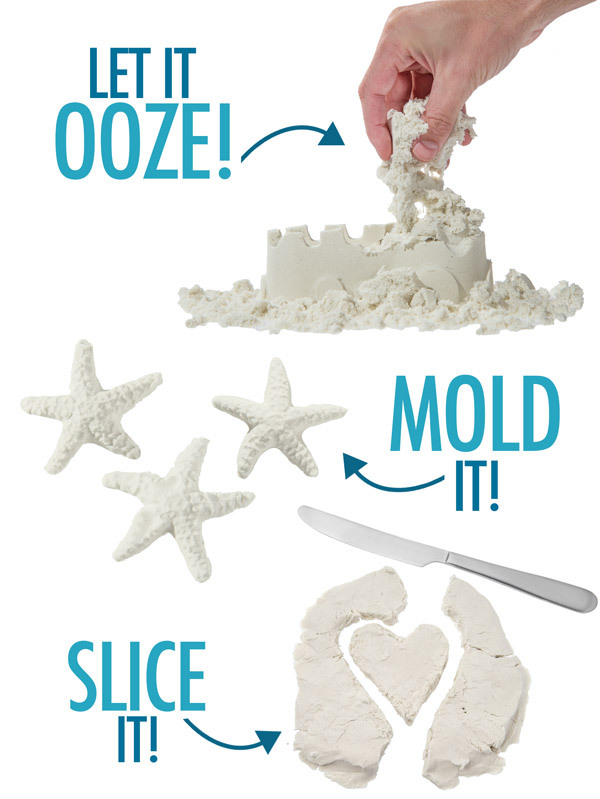 That means you’re free to sculpt and mold shapes that wouldn’t be possible with normal beach sand. This sand is so packable that you can even slice it like a piece of cake and it won’t fall apart. Once you’ve finished your creations, flip off the lights and add glowing details with the included UV pen, or put on the included UV glasses to make all of your work come alive. In episode #5 of Peep This, members of the Vat19 video team take a first look at Glow in the Dark Sand. Glow-in-the-Dark Sand sticks to itself and not your hands. That means it is not only easy to manipulate, but it also makes cleanup a snap. Scoop up a handful and blot it over any nearby areas to pick up those renegade grains with ease. And while clean-up is simple, most of the sand should stay in one place if you use the included sculpting tray. If only regular beach sand cleaned up this easily! 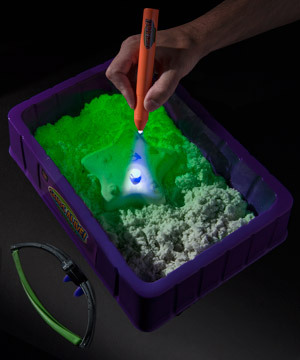 We know kinetic sand is amazing, but Glow-in-the-Dark Sand takes your sandbox creations to the next level. With the included UV pen, you can actually draw on the sand once the lights go out! Draw the eyes of an octopus, add windows to a sand castle, or write your name in a totally new way. Inside the Glow-in-the-Dark Sand box you’ll find one pound of sand, the sculpting tray, and the UV glasses and pen. 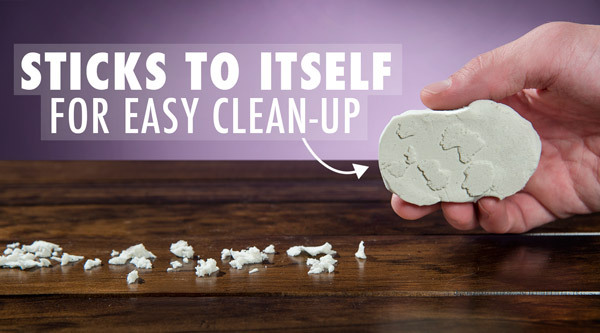 Batteries are included, so dig in and start sculpting right away! 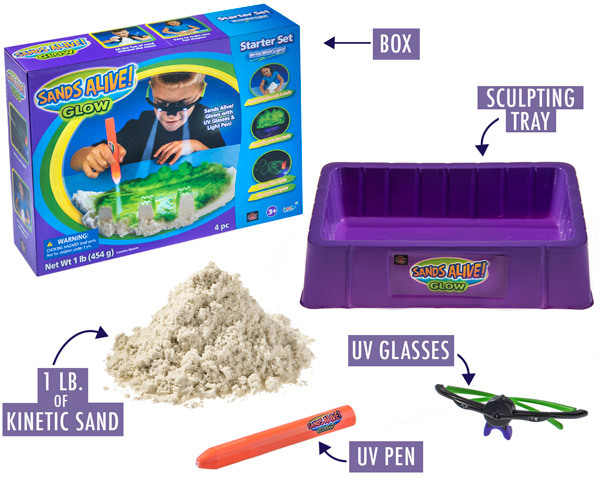 The set includes the sculpting tray, UV glasses, the UV pen, and one pound of kinetic sand. Answer: You really need to play with it to understand how amazing it is to feel, but it’s light and fluffy while still having sand-like texture. It also feels a little wet, but is actually completely dry. Question: How long will it stay glowing in the dark? Answer: After you turn out the lights, the glow will last a few minutes. But with the UV pen and glasses, you can keep that glow going for as long as you want!